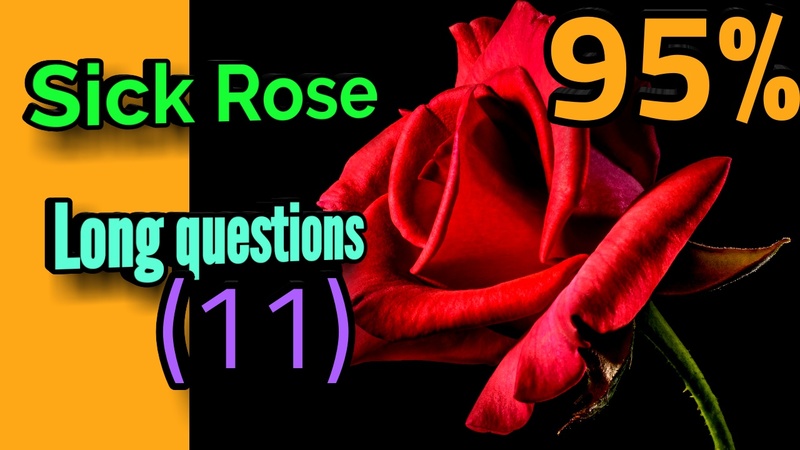 In this article I will tell you about the probable questions and answers from the poem '' The sick rose '' which is very helpful for the students of class 11 in their annual examination . Ans : in the very first line of the poem' 'The sick Rose' 'the poet had warned a rose about its sickness. Then he tells the rose about the cause of its sickness. He cautions the rose that an invisible and secretive worm has found its innermost core. This worm with his dark secret love for the rose is actually corrupting it and leading it towards death. Thus the title conveys not only the main narrative of the poem but also its theme as well. The title 'The Sick rose' also hints at the moral and spiritual message of the poem with its suggestion about the Rose's sickness. Thus the title is meaningful and quite relevant to the poem itself. Ans : In the poem 'The sick Rose' the poet has described the worm in detail. The worm flies in the night of howling storm and it is invisible to the rose. The rose is unaware that the worm has found out the bed of the rose. In the bed of the rose The worm turns Crimson in joy with his dark secret love for the rose. Though he derives Joy out of his love, actually he is destroying the rose with his secretive and dark love. The poet has imagined the worm as a male and it is aggressive and greedy in nature. Ans : The poet has addressed the rose in his poem and declared that the rose is sick. Then he tells about the cause of his sickness. He informed the rose that a worm which flies in the night of howling Storm has stealthily entered into its bed. This worm is destroying the life of the rose with his dark and secret love and at the same time deriving Crimson pleasure from the roses bed . The rose is unaware of the worm's deceitful and destructive activity and the poet warns the rose , that internally it is Losing its life- blood and getting sick. Hope this suggestion will be helpful for you .